According to the Centers for Disease Control and Prevention, 76 percent of Americans don’t get enough fruit each day and 87 percent aren’t eating enough vegetables. The fiber in fruits and vegetables feed the good bacteria in your intestinal tract, and a health gut can significantly reduce the risk of high blood pressure, diabetes, heart disease, cancer and more. When you can, you should also try to choose organic fruits and vegetables to avoid the pesticides that are used when growing crops. However, if you have no choice, it is still better to eat fruits and vegies than to not eat them. That brings us to the topic of eating seasonally. 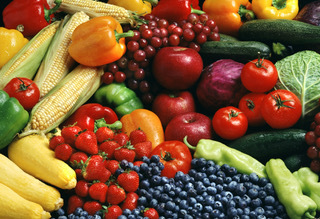 Fresh produce is available at different times of the year depending on seasonal changes and your location. There are many advantages of eating the fresh products that are in season. During the winter months, our bodies require higher levels of Vitamin C, important in warding off colds and flu. Happily, citrus fruit, loaded with Vitamin C, is an abundance at that time of year. During the summer month, our bodies need beta-carotenes to help protect against sun damage. Lucky for us, stone fruits have an abundance of beta-carotenes and are in season during that time. Products that are allowed to naturally ripen on the vine or tree and harvested at the peak will have much more flavor and nutritional content. Chilling and shipping can reduce the healthy benefits. The cost of produce goes down when there is an abundance of it for sale. Take advantage of the abundance to eat healthy. When produce is in season, it also makes sense to purchase in bulk and preserve, pickle, freeze or store it. When food is shipped in from other countries, you can’t be sure what their regulations are on pesticides, herbicides and fungicides or even fertilizers. Eating seasonally reduce things like shipping, refrigeration and preparation costs, as well as providing welcome support for local farmers in your area. During the winter months, start stocking up on fruits and vegetables high in Vitamins A and C, like citrus and root vegetables. Evolution has hard-wired us to crave the first greens of spring. Historically, that was because such produce wasn’t available. But that hasn’t changed what we want… like cabbage, all lettuces, peas and more. In the summer months, our bodies crave the products that contain beta-carotenes like stone fruits, the high micronutrient content of berries, and anything that has lots of water and juice, like watermelon. In the fall, our bodies start gearing up to fight off infections, so we begin to crave things like apples, root vegetables and cranberries. Americans consume an average of 44 pounds of apples per person per year. Americans consume nearly 400 million pounds of cranberries per year, 20 percent of them during Thanksgiving week. Starchy vegetables eaten with a balanced meal can help control appetite and delay hunger cues, which is important for weight management, fighting cravings and reducing the risk of insulin resistance. Chicago’s Rush University Medical Center found that people who ate one to two servings of leafy green vegetables each day experienced fewer memory problems and cognitive decline, compared with people who rarely ate spinach.